In the spray booth at work. 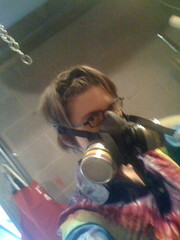 I was working inside the troll head and i had to wear the gas mask, which i absolutely hate. it smells bad, like other peoples spit. and i cant stand having something over my face like that. i don't even like having my face buried in lisa. or wearing turtlenecks. I had to keep convincing myself to keep breathing and not panic, because hyperventilating would only make the problem worse, obviously!